A man said to be suffering from a mental illness was found dead in an apparent suicide on Wednesday at a remote area in Barangay Poblacion, Candijay. It was the sixth suspected suicide case recorded by police since Thursday last week. According to Candijay Police Station commander Chief Insp. Joseph Berondo, the fatality, Jimmy Piquero, 31, hanged himself from a mango tree at a hilly area in the village using a rope. Residents in Barangay Poblacion found the lifeless body of Piquero, a resident of nearby village Barangay Boyoan, at around 5 a.m.
Berondo said that Piquero was taking medicine for his mental health. Authorities, based on their initial investigation, noted that Piquero was not able to take a dose of his prescribed medicine prior to his death. Investigators did not find any indication of foul play in Piquero’s death. According to Berondo, Piquero’s brother also committed suicide over a decade ago by jumping from a cell site tower in Barangay Boyoan, Candijay. Since Thursday last week, police have recorded five other suicide cases in Alicia, Anda, Talibon, Tagbilaran City and San Isidro town. 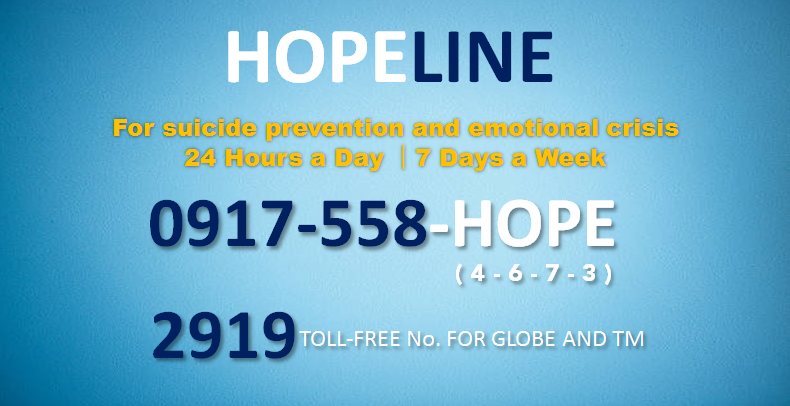 In 2016, the Department of Health with the World Health Organization and Natasha Goulbourn Foundation launched Hopeline, a suicide prevention hotline, as part of efforts to address mental health issues affecting Filipinos nationwide. Hopeline Philippines can be contacted through 0917 5584673 and 2919, a toll-free number for Globe and TM subscribers. However, in a check made by the Chronicle, only the “09175584673” number immediately took the call. Hopeline Philippines had earlier explained that although its hotlines are operational 24 hours a day, seven days a week with no lunchbreaks, no holidays, and no prescribed business hours, it is only capable of handling 12 calls at a time, with only three crisis responders every shift. If the line is busy, callers are encouraged to call after 15 to 20 minutes — the average duration for each phone crisis intervention. For his part, psychologist and Chronicle columnist Kit Balane admitted that addressing mental health issues could be costly in the Philippines. He expressed hope that the implementation of the Mental Health Law, which would provide affordable and accessible mental health services for Filipinos, would be expedited. Balane also noted the importance of family members and friends in showing support to those in distress or those showing signs of despair or depression.